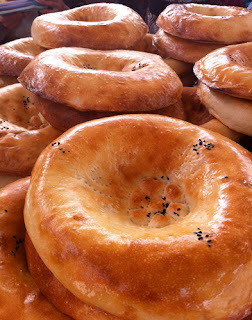 Uzbek non (flat bread) is scrumptious. And for Uzbeks it is more than just food: non is sacred. Non is placed under the head of a newborn as a way of wishing it a long, healthy life. It is put between the legs of a baby who has just taken its first steps, to provide a blessing for its path. Mothers make their sons take a bite hoping they will soon return safely from war or army service. Life without non is unthinkable. At any Uzbek market, there are endless rows of non with different designs, names and aromas. Everywhere you go you can see bread sellers wheeling non around in old-fashioned, big-wheeled baby strollers straight from the tandoor oven. Indeed there are more than 30 types of Uzbek non. Bakers and householders stamp the centre of each non with an instrument - a chekich. The chekich is a carved handle with metal pins or nails set into it. It produces a distinctive pattern, based on a traditional design, and keeps the bread from rising. Chekichs match my idea of a perfect souvenir: charming, small, inexpensive and evocative. Mirfayz Ubaydov of the Silk Road Tea House and Spice Shop, Bukhara, has lovely chekichs in a range of sizes and patterns, which sell for $4-$8. Update September 2017: Good news! If you are unable to visit Uzbekistan to buy a chekich, Shakhista Turaeva has opened an Etsy shop with a lovely selection.